The first UK tourists to be flown back early from the Egyptian hotel where a British couple died have arrived home.John Cooper, 69, and his wife Susan, 63, died at the Steigenberger Aqua Magic resort in Hurghada on Tuesday.The couple's daughter, who was also staying at the hotel, said she believed their deaths were suspicious.Following the deaths, Thomas Cook said it was removing all its customers from the hotel as a "precautionary measure". The tour operator added that the circumstances of the deaths were "unclear". The couple's daughter Kelly Ormerod, who was staying in the hotel with her three children, told the BBC something "doesn't add up" about the explanations of her parents' deaths. "I believe their deaths are not due to natural causes," she said. "My parents went to sleep on the Monday evening, fit, healthy and in good spirits, and awoke the following morning in very poor health. 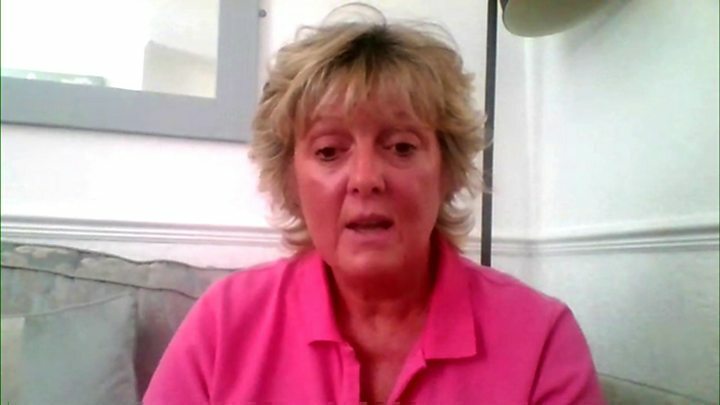 "Mrs Ormerod said the authorities had failed to keep her updated on the situation and were preventing her from leaving the country. "I need answers," she added.In a statement, authorities in Egypt said Mr Cooper died in his hotel room at 11:00 local time on Tuesday.He had suffered a "sharp drop in blood circulation and a sudden stop in the heart muscle", and his cause of death was listed as "sudden failure in the heart muscle and respiratory failure".Mrs Cooper was taken to hospital five hours later in a "state of fainting" and, although heart recovery work took place for 30 minutes, she died at 17:12. The authorities said her cause of death was a "drop of blood circulation and respiratory functions".Egypt's tourism minister Rania Al-Mashat told the BBC the public prosecution office was investigating and would report "within the next week or 10 days".Thomas Cook said the circumstances of the deaths were "unclear", but it had no evidence that carbon monoxide was a factor.On Thursday, it said it had received "further reports of a raised level of illness among guests" at the hotel.It said 301 holidaymakers would have options for different hotels from Friday and those wishing to go home would be flown back.Sven Hirschler, senior director of corporate communications for Deutsche Hospitality, which owns the Steigenberger brand, said there was not an unusual level of illness among the 1,600 guests staying at the hotel.He said that Mr Cooper had complained of low blood pressure and was treated by the hotel's on-site doctor on the day he died. Janette Rawlingson, 43, from Chelmsford, Essex, who arrived at the hotel with her husband and two children on Tuesday, said Thomas Cook staff told guests at a meeting it was testing samples from the restaurant and swimming pool. "Other guests are saying there are 40 people ill at the hotel with vomiting and diarrhoea," she said. "A reasonable person can't help but wonder if there's a link between that illness and these deaths. "Other holidaymakers have told the BBC about their experiences with illness during stays at the Steigenberger Aqua Magic. Janine Traviss, from Oldham, said she and her partner fell ill with a stomach bug during a holiday earlier this month. "I subsequently have been ill for several weeks now since returning and had to visit the doctor on two occasions with two full weeks of antibiotics," she said. "I am still recovering and still feel very tired and exhausted most days. "Thomas Cook said it was working closely with the hotel and supporting the local authorities with their investigations. It stated the hotel was last audited late last month and received an overall score of 96%. 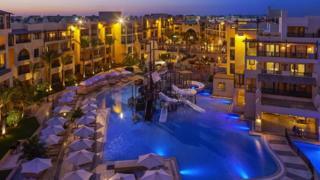 "We will be contacting those customers due to travel to the Steigenberger Aqua Magic Hotel in Hurghada in the next four weeks to offer alternative holiday options," the tour operator added.